This week we have achieved a remarkable milestone in Quadrant Alfa (The company through which canalizo training courses that impart directly): All our courses can be subsidized through the Tripartite Foundation. In practice, this means that for many companies, the courses we offer are free or almost free, as may recover amounts invested in training, via a bonus trading on fees paid to Social Security. The whole procedure take place from Alpha Quadrant. We will debut in the next Course WordPress to be held in Amposta. LCompanies wishing as a bonus of 340 euros for the course can apply by writing to formacio@quadrantalfa.com this week before Thursday (aid can not be processed if it is within 7 days for training). From here I take the opportunity to congratulate the whole team of the accounting department and training, which together have made this good news. We are already preparing a new edition of the course Creating websites with WordPress, Made in BarcelonaAnd in the June issue, the course will impart from the 3isic (International Institute for Research in Information Society and Knowledge www.3isic.com). All students receive a diploma "Specializing in creating websites with WordPress"Issued by the Institute. This course will begin on September 16 and will consist of 4 sessions of 4 hours each. These sessions will be held on days 16, 18, 20 and 26 September in Hotel Grums Barcelona (next to the Metro Paral·lel). Hours are from 16 to 20h. The website that each student will create perfectly indexed on search engines (explain the SEO for WordPress), contain codes Google Analytics so that students can keep track of visits and contacts received, will be registered with Google Webmaster it will automatically connect to the major social networks and if the student wishes, it can also be multi-language translation with automatic or manual translation. To do this, the student must have a domain name and a hosting (Web hosting) in which the WordPress install. The domain name has a cost between 10 euros / year and 15 euros / year for a "dot com". The hosting is a cost ranging between 50 euros / year and 80 euros / year, although for our students is free the first 6 months thanks to an agreement with the company CDMon.com. If you want to welcome you to the free hosting CDmon, please indicate this when booking the course and we will send codes that allow you to hire the hosting for zero euros. The total course fee is 340 € / student. For your information, the market value of a website done in WordPress It is 3,500 euros, so less than 10% of its price and an investment of 16 hours of your time, you can get the website you long, and learn how it is created. During class, he personally advise each student on the particularities of each website and it will work both individually and in groups. We will be 2 teachers, Helena Casas and myself, together we will advance the creation of the website each. Students of Master in Digital Marketing bimbs edition April 2013, can attend for free to this course, but you also need to register. If you are enrolled in master's or going to enroll in the November 2013 features you can take this course in person by attending these classes or online. We are already preparing a new edition of the course Creating websites with WordPressHeld in Barcelona, ​​but this time, the organizadoes are 3iSIC (International Institute for Research in Information Society and Knowledge www.3isic.com). This course will begin on June 5 and will consist of 4 sessions of 4 hours each. These sessions will be held on days 5, 12, 19 and 26 June (every Wednesday June) in the Hotel Grums Barcelona (next to the Metro Paral·lel). Hours are from 16 to 20h. The website that each student will create perfectly indexed in search engines, contain codes Google Analytics so that students can keep track of visits and contacts received, will be registered with Google Webmaster, it will automatically connect to the main social networks and if the student wishes, it can also be multi-language translation with automatic or manual translation. To do this, the student must have a domain name and a hosting (Web hosting) in which the WordPress install. The domain name has a cost between 10 euros / year and 15 euros / year for a "dot com". The hosting is a cost ranging between 50 euros / year and 80 euros / year. To facilitate the installation of WordPress, buying domains and hosting contracting have signed an agreement with the company CDMon.com offering these services. This company offers a hosting with preinstalled WordPress, free for 6 months, change your logo appears as a technology partner on the website of the student. If you want to take advantage of this promotion, please indicate when booking the course and we will send codes that allow you to hire the hosting for zero euros. If you are not interested in the promotion, also we recommend hiring a preinstalled WordPress hosting you have, since you will save spend time on the technical part of the installation of this content manager. To help guide you, these are the features offered in the Junior CDmon hosting (which is what we recommend) https://www.cdmon.com/cas/hosting/ . In case you do not get a hosting with preinstalled WordPress, do not worry, you will install the first day of class. Be sure only to have the login and pasword of your hosting and it allows the creation of a database. The rest will do in class. He market value of a website done in WordPress It is 3,500 euros, so less than 10% of its price and an investment of 16 hours of your time, you can get both anelas website, and learn how it is created. During class, he personally advise each student on the particularities of each website and it will work both individually and in groups. We will be 2 teachers, Helena House and me, together we will advance the creation of the website each. Students of Master in Digital Marketing bimbs edition April 2013, can attend for free to this course, but you also need to register. If you have already registered the Master, it features you can take this course in person by attending these classes or online. New in this edition, and seeking to see how it goes, we opened the last two sessions of the course to alumni who have doubts or who want to delve deeper into WordPress. The cost of these booster sessions is 50 euros per day. Acojerse to this service is absolutely necessary to have done and any of the courses taught by Helena WordPress, by me or by both at once. How I can create an e-commerce? This is a question that I answer every day ... so here goes this article to help anyone who is in the same situation as many of my students both empesas and college. First, decide what e-commerce platform will use. If you're going to have many products, I recommend a Magento (See this website -> www.textura-interiors.comThis is a Magento). Ideal if what you want is to plug your web management software with your store or with any other program. But you'll need the help of your computer to make connections. Where host a Web site e-commerce? I recommend a web host that has preinstalled software that you will use (the two I recommended above, or any other content manager). In my classes I recommend the Junior Hosting CDmon https://www.cdmon.com/cas/hosting/ Preloaded leads most content managers and costs 70 euros per year. Other companies such as Arsys also carry pre-installed in some of its properties, so ask your internet service provider. All content managers you'll find preinstalled in hosting services have plenty of free templates that are great. But my advice is to select one that has a professional design and someone has verified the usability of it ... especially in this case, the shopping cart. Therefore I recommend buying professional templates. The market where I buy them is www.themeforest.net there you will find templates for WordPress and Magento templates (as well as other content managers). The cost of the templates is between 45 euros and 55 euros for WordPress, and 80 euros for Magento. Sort them by "selling" and make sure you have 5 stars. So you choose one that certainly does not give problems. Do I need a domain name for my ecommerce? Yes. Neither dudes. It is your corporate image and you need your website to have a proper name. You will also need your email address with your domain name. You can buy them in any company offering this service. A domain usually cost between 10 euros and 15 euros per year. Internet (both Google and Youtube) you will find manuals, videos and tutorials that will help you throughout the process of creating the website both in the case of WordPress as in Magento. WordPress is much easier Magento ... so if you have no experience in these pages, I would start a WordPress. You will need a total investment of about 200 euros ... and have the online store in a few days (this afternoon to enter the content). If you still need help, I recommend attending one of our courses WordPress. Last week ended on April, May will be held at the Chamber of Commerce of Sabadell and is 3 days in June, we will make one in Barcelona and will be 4 days and we may make another in Terrassa also in June . When more dates approach, I will publish on this blog. I go all right. I hope I've been helpful. https://www.montsepenarroya.com/wp-content/uploads/2013/04/ecommerce_interior.jpg 243 814 Peñarroya Montserrat https://www.montsepenarroya.com/wp-content/uploads/2017/09/MP-Logo-Web-1.png Peñarroya Montserrat2013-04-29 09:00:272013-09-28 19:16:57How I can create an e-commerce? I know that there are still many days in April ... but during January some students were on the waiting list, so we have opened registration for the next course Creating websites with WordPressWhich will take place in Barcelona. This course will begin on April 3 and consist of 4 sessions of 4 hours each. These sessions will be held on days 3, 10, 17 and 24 April (every Wednesday April) at the headquarters of bimbs (Barcelona International Management Business School, c / Montevideo, No. 31 [behind the Monastery of Pedralbes] 08034 Barcelona ). Hours are from 16 to 20h. Students of Master in Digital Marketing bimbs edition starting in March 2013, can attend for free to this course, but you also need to register. If you have already registered the Master, it features you can take this course in person by attending these classes or online. Although still missing a few days, as the number of people asking me about it, and the course announcement Creating Web sites using WordPressTo be held next January in BarcelonaAt the headquarters of bimbs (Barcelona International Management Business School, c / Montevideo, No. 31 [behind the Monastery of Pedralbes] 08034 Barcelona). The course will consist of 4 sessions: Wednesday 16, 23 and 30 January and 6 February, from 16 to 20 h.
The total course fee is 280 € / student. Students of Master in Digital Marketing bimbs starting tomorrow, can attend for free to this course, but you also need to register. On 18 and 20 September, Forest Technology Center of Catalonia Solsona organized a course on creating websites using WordPress as a platform for creating and managing content. This course will be held in 2 sessions of 6 hours and aims students to build their own, fully functional corporate website with optimal indexing Google and built web analytics. To do this, students come to class with a hosting and domain name hired, and your own computer is requested. In class the fitting of WordPress will work (although it is better to hire a hosting students who already have it installed, I recommend Accommodation Junior CDmon, Which already leads preinstalled). During the classes, we will see how search engine optimization works, how to get a multilanguage site easily, how to obtain reliable statistics as quickly indexed in all search engines, etc. The registration deadline is September 12. To ensure that all students finish their classes online web and running, the maximum number of participants is 15. Already opened the deadline for registration of Course Creating Websites with WordPress Corporate which will be held at the headquarters of the Barcelona Global Business School, in Barcelona. The course is 12 hours and held next 17, 18, 19 and 20 July, afternoon (16h to 20h). The aim of this course is that students leave class with a corporate website 100% complete and functional. Even with the content created. We will also create electronic commerce, provided that WordPress is used as content manager. To achieve this goal this course is only open to students who attend class with a WordPress installed on your domain and knowing how it works at a basic level (distinguishing between pages and tickets and knowing how to publish content in general). No se tratarán temas relacionados con la instalación del software. Se tratará únicamente qué plugins necesitamos para convertir una instalación de base en una web corporativa, cómo debe ser un “quienes somos”, un “qué hacemos”, un formulario de contacto, un catálogo de productos, una galería de imágenes, un “dónde estamos”, cómo incluir otro contenido en el sitio web, cómo instalar plantillas profesionales (el alumno podrá traer sus plantillas o comprarlas online mientras asista a clase). Así mismo, veremos cómo crear una landing page para una campaña publicitaria. We will also see how to create a multilanguage site, how to install Google Analytics codes, such as recording onto Google Webmasters, what metrics should follow, etc. As I said, the goal is to get out of there with web made, so it comes to investing in these 4 afternoons out of the office and the daily life of each, to focus on the website. 1) Buy a domain name in www.cdmon.com (If you have it, you can skip this step). 2) Hire a hosting already installed WordPress. You can do this in www.cdmon.com, Contrantando the Junior hosting https://www.cdmon.com/cas/hosting/alojamiento-web/ (5 euros per month). If you just want to try, you can hire him for months. In the hosting control panel you will see that have preinstalled WordPress, activate it and is already (no extra charge). 3) Practice at home using wordpress, create a profile, create a page and generally plays a little so that when you start the advanced class, you know how the basic part works and can focus on converting the installation of series in a good website. 4) If you want to go a little further, look at the free templates you'll find WordPress.org and payment also find www.themeforest.netIf you find a template you like, download it to your computer and upload it to your wordpress. CDmon note: I recommend this company because they are lovely on the phone and is preinstalled WordPress hosting. I have no connection with them. The course is organized la Barcelona Global Business School and it is taught in its facilities Barcelona street Montevideo 31. The course has a cost of 350 euros and places are limited to 20 people. 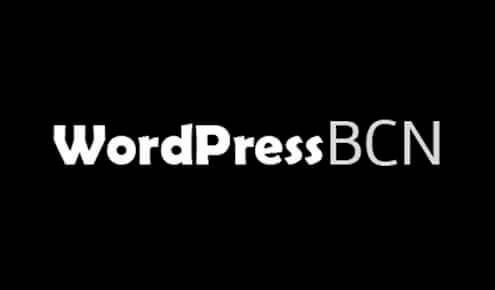 My students at UAB Basic Course WordPress have a 20% discount, if you're one of them speaks with BGB and indícaselo. We finally have a date for class Building a Web site using a WordPressFor students of my Masters Courses Autonomous University of Barcelona. The classroom is not confirmed yet, and depends largely on the number of students who sign up. Remember that this class is not part of any master and is completely voluntary and free. I give only to those who wish to learn how to make a website you may do so. The first 2 hours, install a WordPress on the server that you may have contracted. To make the website professionally you need a domain name (about 15 euros) and hosting (web hosting, which can cost about 60 euros). If you buy here: www.cdmon.com and you contract the Junior Unihost service, it already has pre installed WordPress and less and save you attend the first half of the class. The following 2 hours, the dedicate learn how to use WordPress and transform it into a corporate website. We can not finish the website, but at least you will have the developed structure. If you do not want to hire anything but wish to learn how a WordPress works, you can use the free WordPress without hosting without domain www.wordpress.com ... but this is not suitable for a corporate website. In this case, it is not necessary to attend the first 2 hours. Whether you come to 4 hours if only 2, you need to write an email to PMASTERS informing your attendance (so we can decide what we class classroom) recepcion.pmasters@pmasters.es . For your information, I take this opportunity to announce that on 17, 18, 19 and 20 July afternoon impart some lessons in Barcelona Global Business School in order to start and end the corporate website of any company (including e-commerce ) using WordPress. This class is open to everyone, students and companies. 4 sessions with other end with the website finished and running with all content created too. These sessions are not free (350 euros for 4 days), but if someone wants to come, will make a 20% discount if indicates that it is my student at UAB. You find more info at http://bgb-school.com/ and instructions to enroll. Between tomorrow and I will write a post explaining this event in more depth.